Fox Home Entertainment has provided us with an exclusive clip from the new Blu-ray release of Willow, debuting on March 12th. 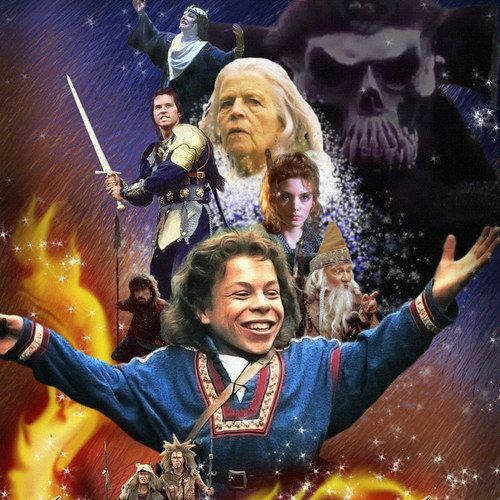 George Lucas wrote the screenplay for director Ron Howard's magical adventure, which follows Willow Ufgood (Warwick Davis) on his quest to protect an abandoned baby and defeat the powerful evil forces around him, with the help of a swordsman named Madmartigan (Val Kilmer). Take a look at this scene where Madmartigan flees from a foul, two-headed fire-breathing beast. You can also CLICK HERE for details on a Twitter chat being held by Ron Howard and Warwick Davis on March 12th. When young Willow Ufgood (Warwick Davis; Harry Potter franchise) finds an abandoned baby girl, he learns she is destined to end the reign of the wicked Queen Bavmorda (Jean Marsh; Upstairs, Downstairs). In order to protect the child, Willow must team up with a rogue swordsman (Val Kilmer; Kiss Kiss, Bang Bang) and overcome the forces of darkness in the ultimate battle of good versus evil! The Willow Blu-ray and DVD include a dazzling array of extras with never-before-seen exclusive content such as deleted scenes with remarks from Ron Howard, a personal video diary of Warwick Davis, matte paintings and much more. In addition, look out for Ron Howard's new introduction for the original 1988 featurette "The Making of an Adventure," as well as special effect legend Dennis Muren's new intro to his piece, "From Morf to Morphing: The Dawn of Digital Filmmaking."